Yippee – I can officially say that our route is beginning to come together! After spending some time in Portland and Corvallis (Oregon), we’re headed up into Washington. The exact route is yet to be determined, but we’d like to roll through Seattle, the Olympic Peninsula, perhaps the very West part of the state (along the ocean), and the San Juan Islands (which I am particularly excited about, as I have one fuzzy memory of Orcas Island from a mid-1980s family vacation). Then, we’ll head across Washington into Idaho (crossing at Clarkston or Pullman?) – and on to Montana (to Arlee, home of my relatives, and Missoula, home of Adventure Cycling). From Montana, we’re going to head South West, dropping into Eastern and Central Oregon (in an effort to avoid as much snow as possible!). We’re thinking that we’ll wind up riding back down through California, so that we can cross the Southern US during the winter (again, to avoid the snow and such). I’ve updated the google calendar on our “where in the world” page to show where we’re headed. 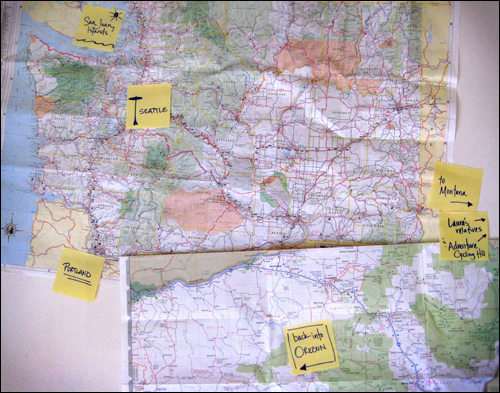 The dates (other than Portland and Corvallis) are extremely rough, so don’t hold us to them, but we wanted to put them up so that we can start connecting with folks that will be along our route. If we’re passing near you (or near someone we should meet and/or interview), let us know! North Cascades National Park is an amazingly beautiful place. But, if you’re headed over the Cascades that way you are in for some lung busting climbs. Totally worth it, though. If you’re headed near Spokane you should contact John from cycling spokane. Looking forward to meeting you both when you’re in Missoula! As for avoiding the snow on a southerly crossing of the US, don’t forget you have to cross the Continental Divide at some point and may encounter the white stuff at higher elevations regardless of when you cross. if you’re in colorado, swing by boulder. yup, platinum status bike city. that’s the one. i’ll arrange some meals and a roof over your heads. maybe i could facilitate some sort of talk/slide show here in town to raise some funding??? good luck with it all!!! in 2000, my wife and i, packed up, resigned, and left for a year long adventure in the philippines. we weren’t on two wheels, but we went thru the process of “letting it all go”. Not “There IS clothes and stuff,” but there ARE clothes and stuff. I constantly hear this grammatical error. Good luck on your tour and presentations. I’m an adventure rider member and was sent a link via email. So I’ve been kinda checking in from time to time to see what’s up. Riding on two wheels, be it a bike or a MC, are my hobbie. Anyway, if you make your way across the US and find yourself in Virgina (DC area) you are welcome to crash with us for a few days. And if not, stay safe and enjoy the ride. You can stay with us in Seattle if you are interested. We live close to the ferry dock in case you are coming in that way (recommended). If you make it to Charlotte NC you have a place to stay a shop to use for repair and resupply!